Marines make legendary sacrifices. On and off the battlefield, we strive to honor their selfless devotion to duty. On Monday, we will honor the legacy of 1stLt Robert Kelly USMC and other Marine families at our annual Capital Area Golf Tournament. 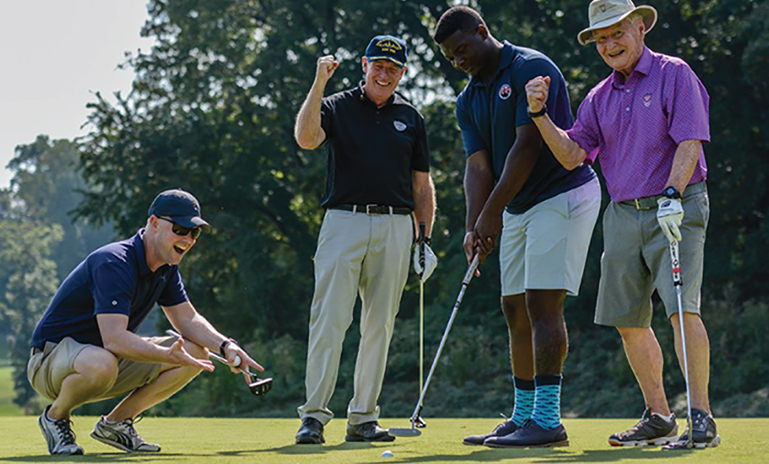 Since its inception 15 years ago, this tournament has raised a total of $1.5 million dollars in scholarships that directly impact the lives of military children. On November 5, more than 140 golfers will take the course at the Army Navy Country Club in Arlington, VA. Proceeds from the event will be dedicated to the 1/8 Marines Battle of Fallujah Memorial Scholarship, established in honor of 1stLt Robert Kelly USMC who was killed by a roadside bomb while on duty in Helmand Province Afghanistan in November 2010. Prior to his 2008 commissioning, Robert served two tours in Iraq as an enlisted Marine with “The Beirut Battalion” 1st Battalion, 8th Marines, serving with distinction as they led the assault on Fallujah during Operation Phantom Fury. At the time of his death, Robert was in his third combat deployment in what was already a distinguished military career. 1stLt Robert Kelly’s legendary sacrifices awarded him the Purple Heart, Combat Action Ribbon, Navy and Marine Corps Achievement Medal, Marine Corps Good Conduct Medal, National Defense Service Medal, and many more personal service awards. The golfers are not the only ones who receive recognition at the event. Each year, the Marine Corps Scholarship Foundation is grateful for the handful of volunteers who help make this tournament a success. If you would like to make a donation to support the Capital Area Golf Tournament, contact Matt Carroll and Scott “Boy” Arnold at capitalgolf@mcsf.org. For other ways to get involved, please visit www.mcsf.org/get-involved.